Ashley and I did a nutritional comparison begtween Yoplait's flavored yogurts and a plain full fat yogurt. It turns out that even if you add a couple of tablespoons of your own sugar to plain yogurt, you still end up with about 10 g less sugar than yoplait's. Plain yogurt kind of grows on you too. The more you eat it, the more you crave that tangyness that is totally lacking in the flavored variety at the store. If I top my plain yogurt with some Berry Syrup and lots of fresh fruit, I don't even need to add any sugar. Throw on a handful of granola, and I'm in heaven. 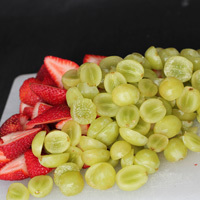 Coarsly chop fruit. Grapes, strawberries, blueberries, and misc berries work well. 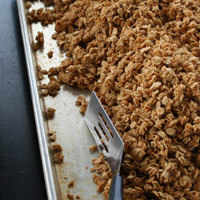 Prepare Ashley's Granola. 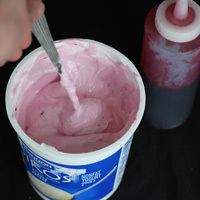 Prepare Berry Syrup and mix with plain or greek yogurt to taste. 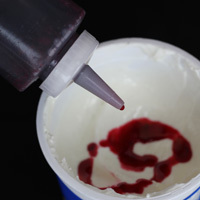 The syrup can be made with any fruit to create different yogurt flavors. For peach yogurt, for example, use peaches in place of berries in the syrup recipe. 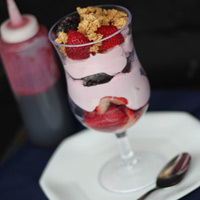 Layer fruit and yogurt in a glass and top with granola. Parfaits will keep for a couple of hours before serving.